Thom Conboy at Merle Wood & Associates sends news overnight that he’s now signed the 52.3m motor yacht Bel Abri for sale in a joint listing with Imperial Yachts. Delivered in 2010, Bel Abri is the latest launch by Amels in the 171 limited edition series and is the only one available for sale. Her exterior was designed by the legendary Tim Heywood creating a look that he describes as "athletically feminine" with the sweeping curves that are reminiscent of Italian sports cars of the 1930s. The interior layout was drawn up by Laura Sessa in light bleached oak and sycamore. Bel Abri sleeps 11 guests in luxury cabins and there is a wide selection of the latest water toys and sports equipment. 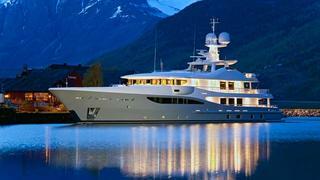 A finalist at the 2011 World Superyacht Awards, Bel Abri is asking €33.9 million.